I love the color of Noodler’s Baystate Blue (BSB) fountain pen ink. How could you not? The bright, vibrant blue is gorgeous. But, this fountain pen ink is said to be evil - very difficult to clean and will permanently stain everything it touches. The staining makes this a polarizing ink in the fountain pen community - you either love it or hate it. But that bright blue is just so gorgeous and tempting that I decided to try it despite knowing the risks of using this ink. This decision was a mistake. I did research and felt like I understood the problems of Baystate Blue. It will stain pens - and everything else - including the sink used to clean any pens! I carefully had to consider which pen I was going to fill with this ink. I chose to dedicate a Pilot Vanishing Point to this ink. The Vanishing Point was the Metallic Desert Orange color which comes with black furnishings and, perhaps most importantly, a black nib. As this was a dark accented pen, I felt that the likely staining would be far less visible than on a standard silver nib and trim. Looking back, this was a wise choice. The Vanishing Point came with an Extra Fine nib. The EF nib was an excellent choice as using a broader, fire-hose type nib with this ink could lead to more copious amounts of potentially dangerous ink on the page than I could handle. I also had a specific use in mind for the ink - I received Leuchtturm’s Some Lines A Day 5-year journal, and the permanent properties of the Noodler’s ink would be ideal for this long-term record. The first time I inked the pen, I felt like Walter White delicately handling the blue stuff - carefully trying to dip my pen into the over-full bottle without spilling a drop, paper towels everywhere. I think I held my breath for the entire time! I managed to only lightly stain two fingers, which I considered a pretty respectable effort. While I appreciate Nathan Tardif’s approach to creating value for Noodler’s customers, I really wouldn’t mind if he didn’t fill the bottles quite that full! I do have to say that the ink is excellent value for money. I purchased mine from Wonder Pens in Toronto for about $16. Looking back, I wonder if this ink should be labeled as a dangerous good during shipping! I love, love, love the color of Noodler’s Baystate Blue. It is the ultimate bright blue. I use the better behaved Mont Blanc Royal Blue in my EDC pens and, while I love the color of the MB ink, it almost appears as washed out compared to the brilliant intensity of BSB. There are no distracting undertones in BSB - I find many blues tend to present to either the green or blue-black spectrum to appear more intense, but the Baystate Blue is a pure, intense blue. This ink looks fantastic on the page and, at first, the terrific appearance justified the risks of using the ink. I was also pleasantly surprised with the performance of the ink. There was little to no feathering; dry time was excellent, and the ink did not dry or clump within the pen and started writing every time. With a dedicated pen, my refilling and minimally required cleaning plan worked well. The black nib, upon close examination, had acquired a blue undertone, but all was going well. I have carried the Bay State Blue filled Vanishing Point in my bag for four months and used it regularly. And it has generally been well behaved. But when it goes wrong, it goes very wrong. All it takes is a rogue drop of ink…. I first noticed that my beautiful leather Pilot Pensemble Pen Wrap started getting a couple of small stains near the pen slot that I keep this pen. A couple of times, I ended up with little blue droplets on my page - perhaps from smudges or from the pen transferring to my hand as I wrote. Annoying, but acceptable in the tradeoff against the beautiful color. But a couple of significant ink transfers over the last couple of weeks have made me rethink the risks. My Pensemble now has a horrible blue stain on it from the transfer of the tiniest drop of blue that had got on the pen. And the pen body is also stained. 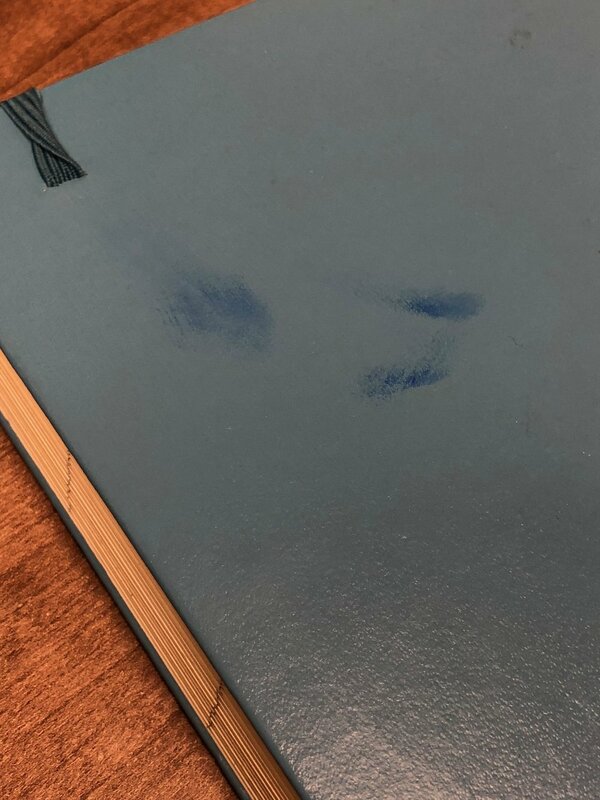 I can see my Pensemble all day as my pen roll sits on my desk, and it hurts to see that blue stain on such a beautiful product! My Leuchtturm Some Lines A Day journal, still into year 1 of a five-year journey, has bright blue fingerprint stains on both the cover and the elastic enclosure band. My favorite pair of khakis has a bright blue spot on my leg (though, clothes stained with ink is not unheard of in my household). And I have had blue fingers for more days than I care to admit to. You can clean Baystate Blue pens with bleach, but bleach isn’t appropriate to clean some of the stains this ink has made. The problem is transfer. Only the tiniest drop of this ink, from a slight pen burp or an errant droplet on a page, can transfer to hands, paper, pen, and clothes. Even using a well-behaved pen and paper, it doesn’t take much. And the transfer is impossible to clean on some surfaces. This ink has the staining power that banks should use in dye packs to identify and catch robbers! While I still genuinely love the blue ink color, the continued and growing transfer problems outweigh the benefits. I have stopped carrying this pen around. And I switched ink colors in my journal, though I will always have the stained reminders of how lovely the color was while I used it. I have, reluctantly, admitted defeat. And, until the next time I am brave enough to try this ink in a much more controlled environment, the bottle returns to my shelf of forgotten and abandoned inks. Should you be tempted to venture into bright blue inks and are seduced by Baystate Blue, you have been warned: use carefully!